Player rankings which are truly unique and custom results based on your league settings. Entering your league criteria can changes the dynamics of player valuations. As innovators in the position scarcity theory, how you draft is equally as important as who you draft. 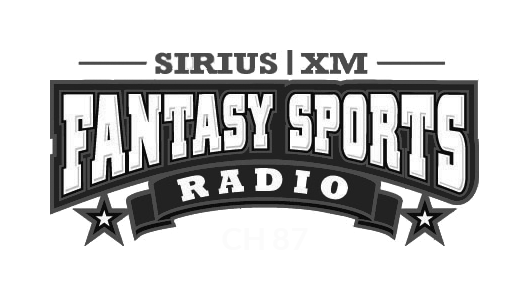 Produces Rankings for Straight Draft Leagues and Auction Dollar Values for Auction/Salary Cap Leagues. Designed for Fantasy Point and Head to Head. Ability to alter stat projections as well. 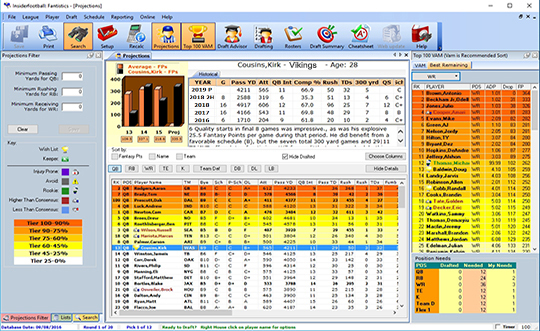 Ease of use: download, install, & customize player projections in less than 3 minutes on any Windows based PC (Windows 10, 8, 7, Vista) or Apple Mac OSX 10.10 or above. 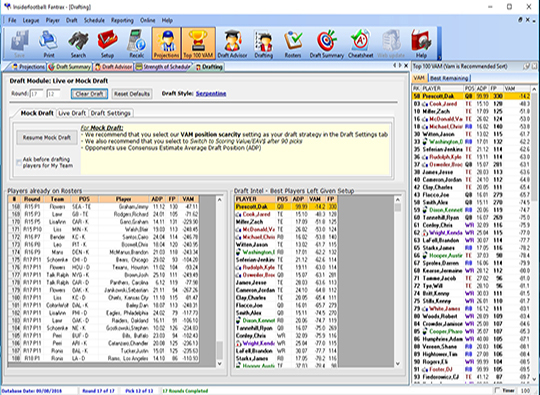 Fantistics was the first football website to introduce the theory of position scarcity to the draft day ritual in 1999. Our draft day 2018 fantasy football projections are based on a 50 year back-tested model that has been extremely accurate in predicting player value. Detailed player projections showing every major statistical category for over 800 players. The Mock Draft module within the Fantistics Player Projections program, allows fantasy GMs to practice drafting skills using our recommended VAM (value ABove Mean) draft strategy. 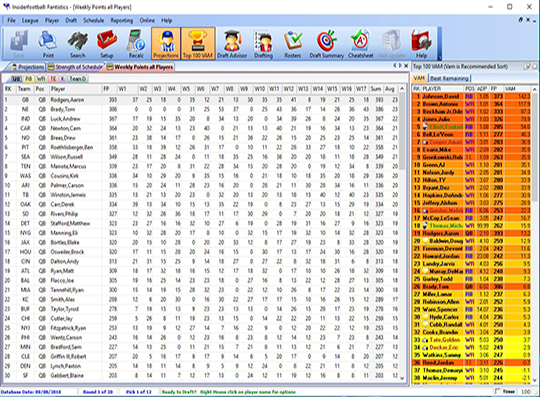 Select one of 6 different ADP models to more closely simulate your league setup. Options include ESPN, CBS, Yahoo, RTSports, and NFFC. Player Projections are built up on a game to game basis, allowing you to see your scoring expectations on both a Player level and Team level, assessing your bye week weaknesses. We’ll highlight the needs, and show you the best available players to fulfill those needs. Strength of Schedule helps you make decisions during your draft. Rankings and Auction values based on your specific scoring format. Rankings are color tiered to highlight tiers of players and include Average Draft Position (ADP) as a reference. 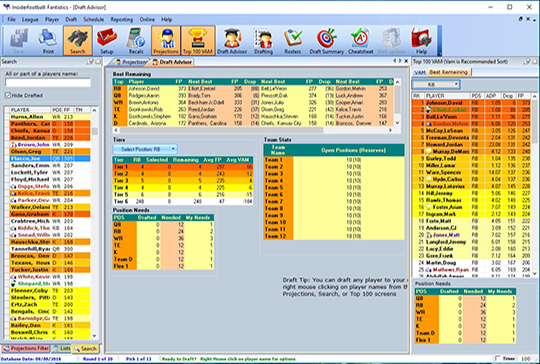 Color coded Customized cheat sheets/ranking lists can be printed or Exported to Excel. We post individual player recommendations for each NFL game. We post these recommendations (projected stats) based on current and historical trends. 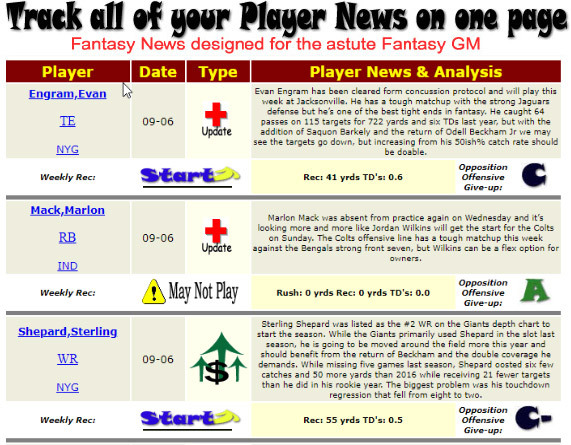 Track up to 12 fantasy teams, player tracker lets you select your team players allowing Fantistics to rank and offer weekly projections on your players. 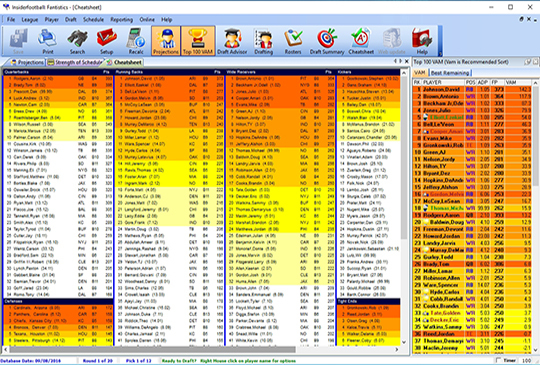 Complete Historical Stats Databases include current and future Rankings. Or Targeted and Snap count data helps fantasy GMs assess which players are seeing opportunities, which often translates to finding value outside of the traditional fantasy points scoring.